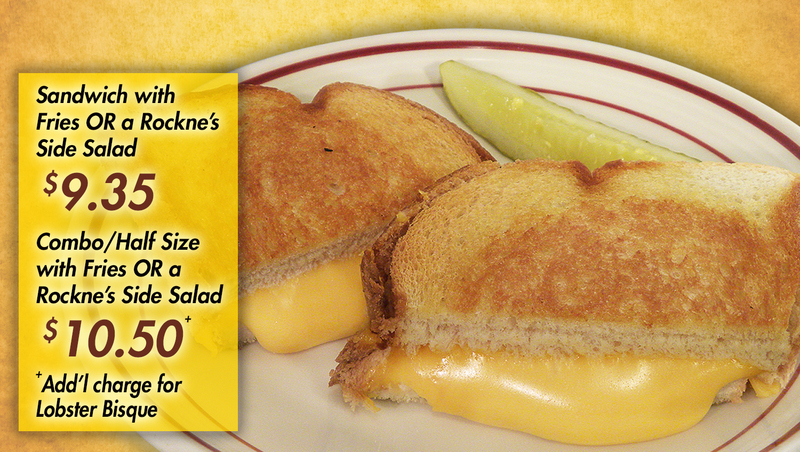 Our Combo size sandwiches equal a HALF SIZE of our Rockne's size sandwiches. Choice angus beef piled high on our buttered grilled bun with melted Swiss & a dipping sauce for dunking - Beef OR French Onion! Choice angus beef grilled with American and Provolone cheeses & a few of our fresh cut fries… topped with lettuce, mayo and Rockne’s® dressing on a buttered grilled bun. Choice angus beef, grilled with sweet onions, mushrooms & peppers… topped with Provolone cheese and served on a buttered grilled bun. 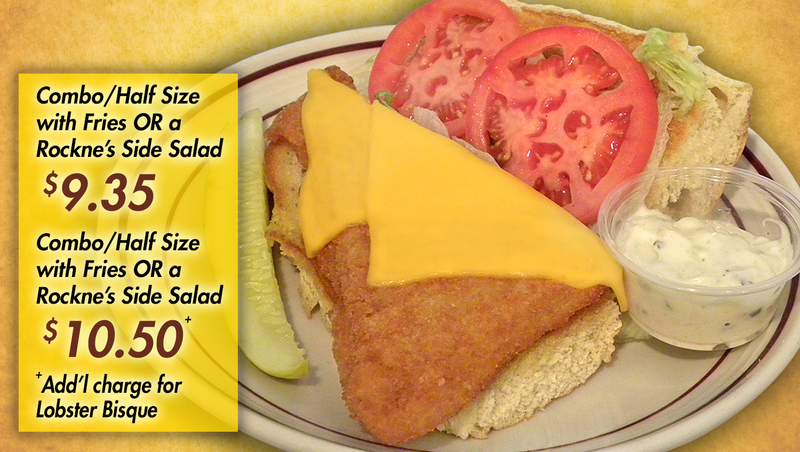 A big plump golden brown, deep fried chicken breast spiced with bacon, pepper jack cheese or a cheese of your choice. 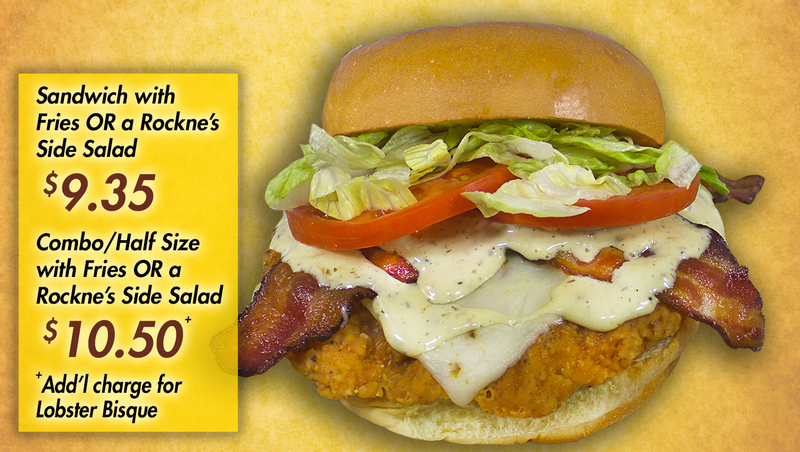 Served on a buttered grilled bun with lettuce, tomato & our specialty sauce. 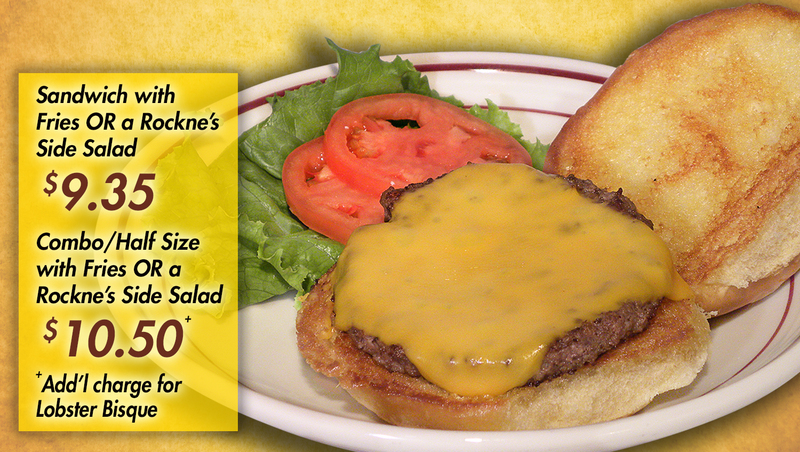 Our number one burger… big, juicy, n’ tasty. 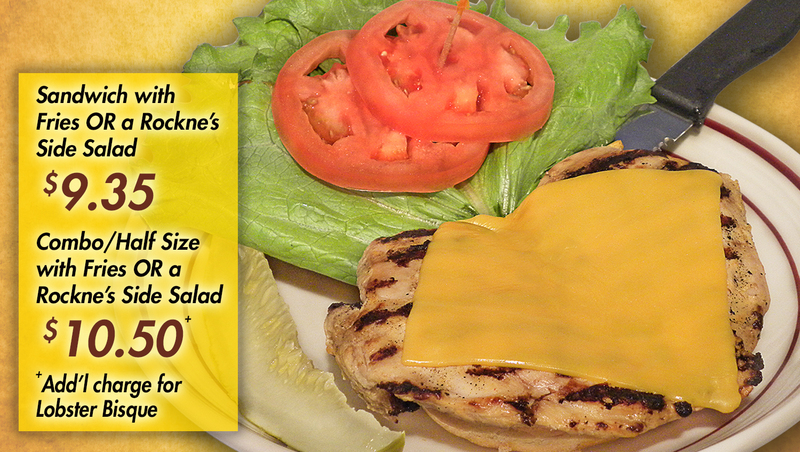 A broiled breast of chicken… served on a buttered grilled bun with lettuce, tomato and your choice of cheese. 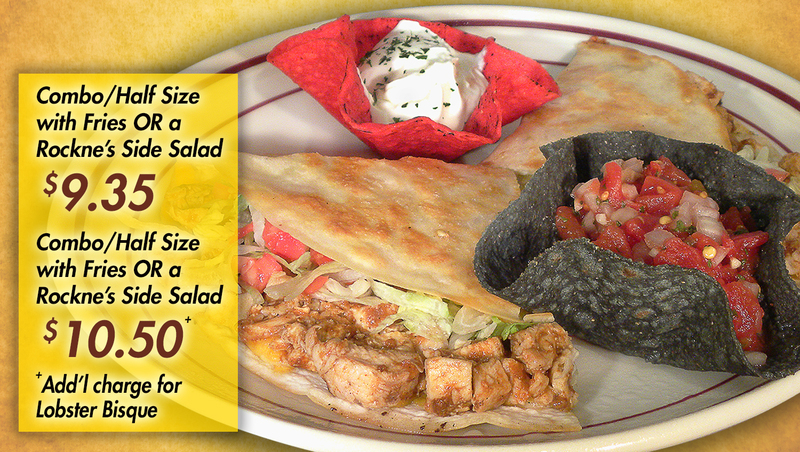 Buffalo style?… just ask! 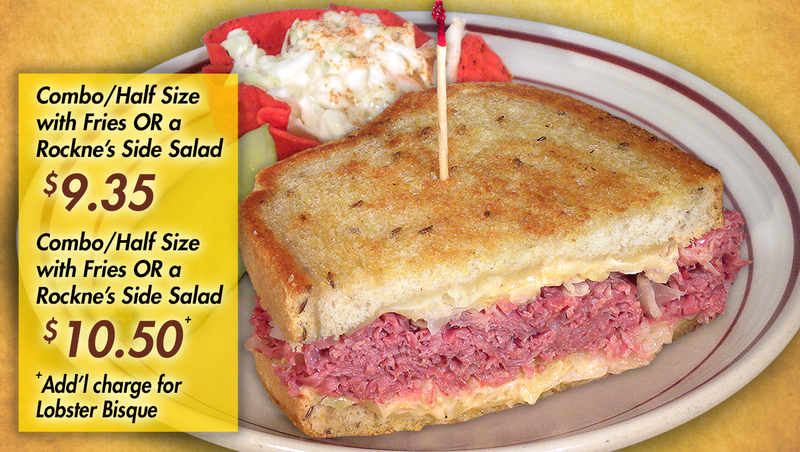 Savory hot corned beef piled high on rye & topped with Swiss cheese, sauerkraut and Rockne’s® reuben dressing, then grilled just right. 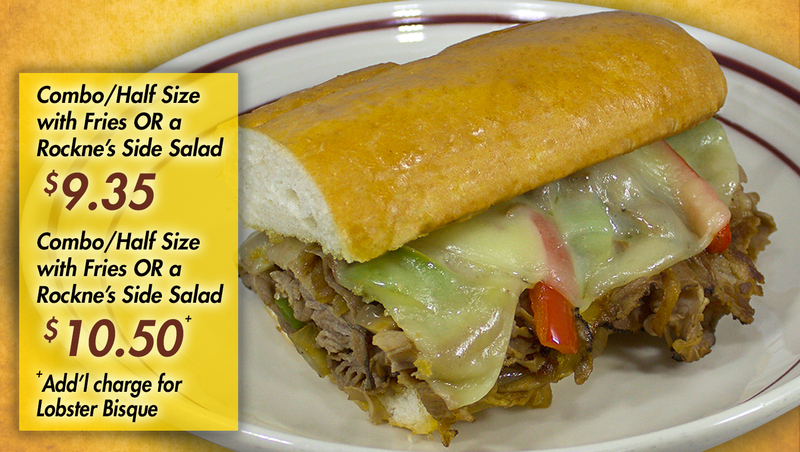 Plenty of melted cheese and served on your choice of thick grilled Texas toast or Wheatberry bread. 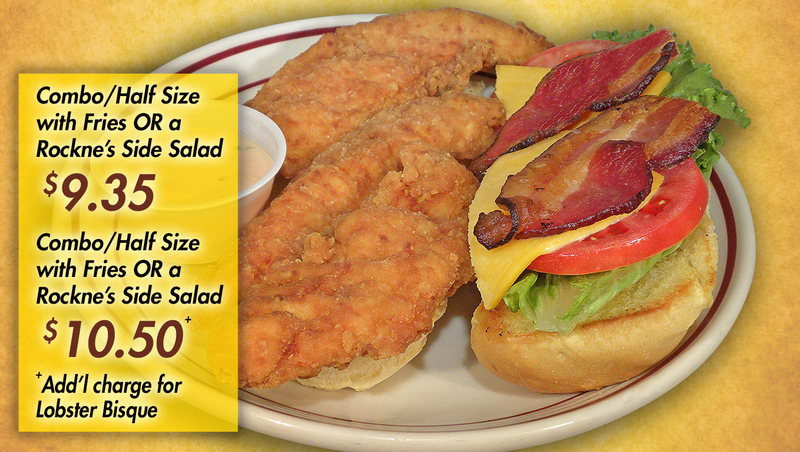 Plump breaded chicken tenderloins with your choice of cheese, bacon, topped with lettuce, tomato on a buttered grilled bun with a side of Max sauce. 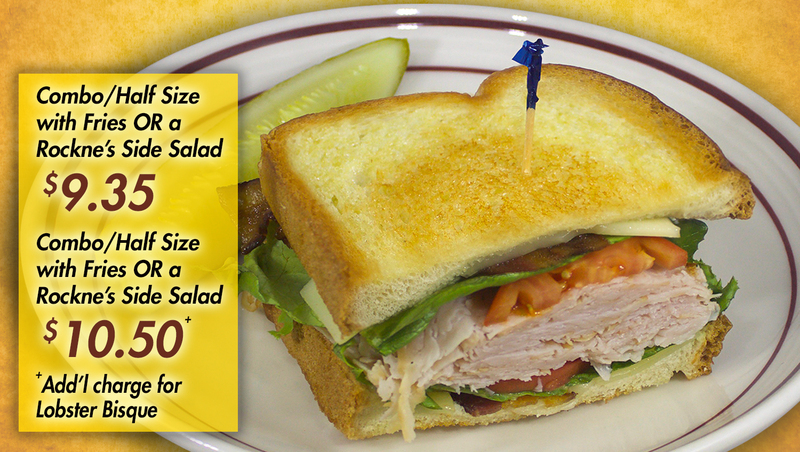 Roasted turkey breast with bacon, lettuce, tomato and Swiss cheese stacked on your choice of thick grilled Texas toast or Wheatberry bread. 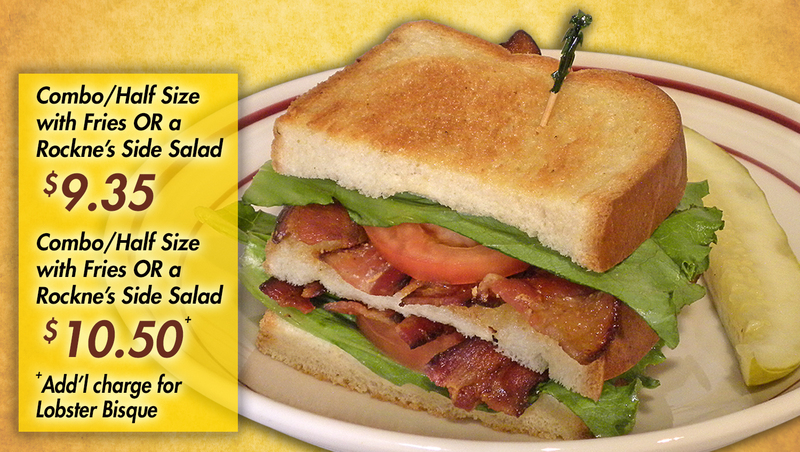 Lots of crisp bacon, lettuce & tomato, served on your choice of thick grilled Texas toast or Wheatberry bread. Served with fresh pico and sour cream. 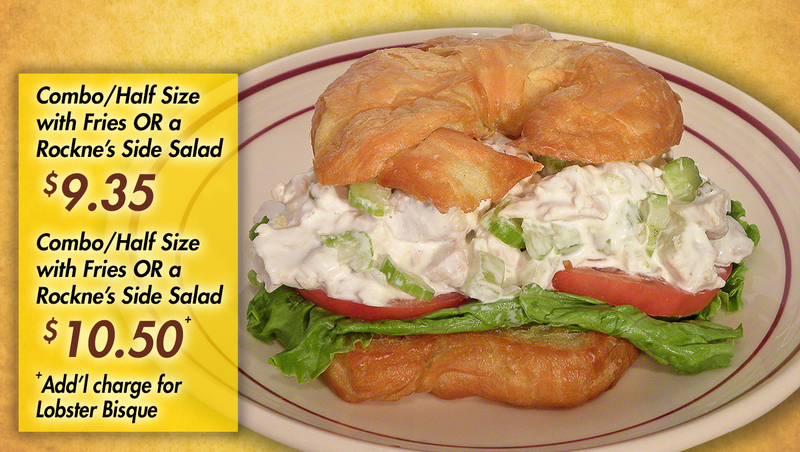 Fresh homemade chicken salad piled high on your choice of a grilled croissant or Wheatberry bread… with lettuce, tomato and your choice of cheese. A fillet of Atlantic cod deep fried to a golden brown. Served on a long bun with lettuce, tomatoes, American cheese and a side of tartar sauce. 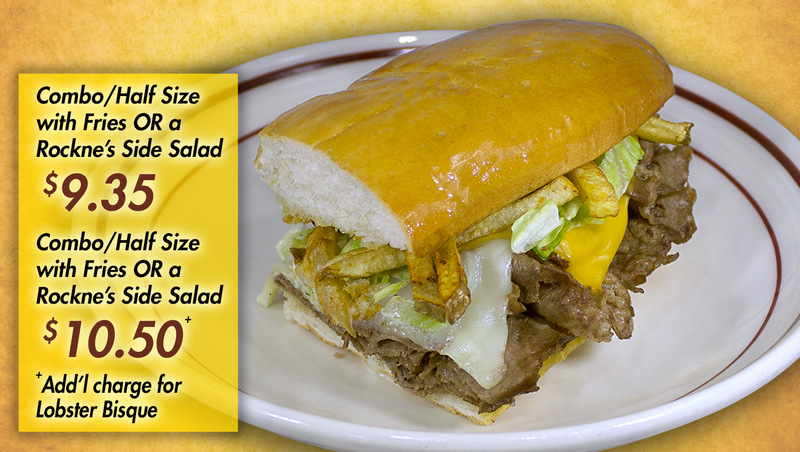 Order any Combo size sandwich [a HALF SIZE of our Rockne's size sandwich] with Fries OR a Rockne's Side Salad. 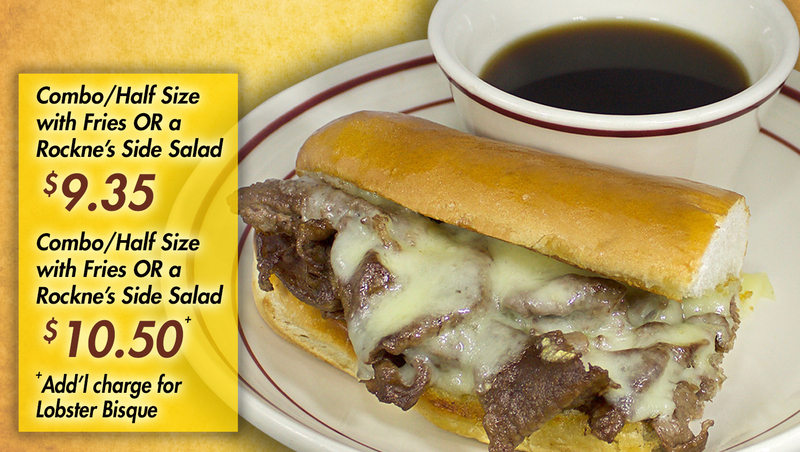 Order any Combo size sandwich [a HALF SIZE of our Rockne's size sandwich] with a Cup of Soup. *Items may be served raw or undercooked. 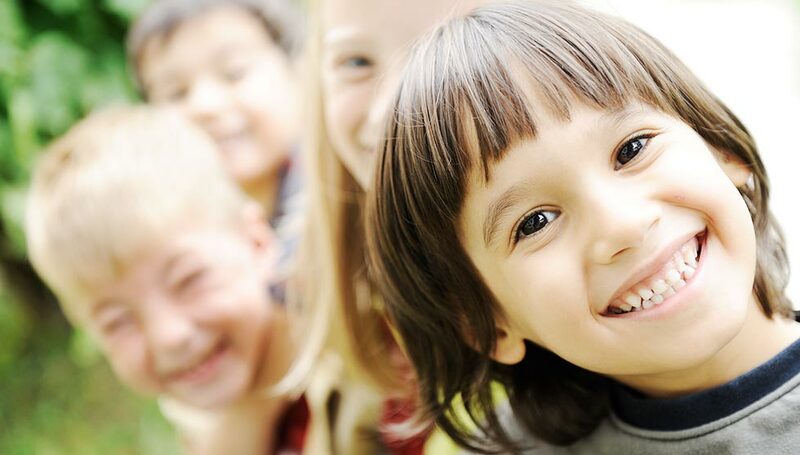 Consuming raw or undercooked meats, poultry, seafood, shellfish or eggs may increase your risk of food borne illness.